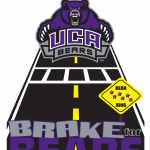 UCAPD and the Student Government Association come together to promote pedestrian safety through the ‘Brake for Bears’ campaign. On specific dates, volunteers and UCA Police officers encourage safety awareness throughout the day at various crosswalks around campus by distributing pedestrian safety information and, while supplies last, official Brake for Bears t-shirts. Do not assume drivers can stop. Look across all lanes you must cross. Even though one vehicle has stopped, another may pass in another lane. Be attentive when entering a crosswalk area. Drive slowly. Be prepared to stop. Do not overtake and pass other vehicles stopped for pedestrians on your side of the roadway. Establish eye contact with drivers before crossing. Do not enter the crosswalk suddenly. Wave or thank drivers who yield. Establish eye contact with pedestrians. Cross the street between the lines within the crosswalk. If you cross the street at a place other than a designated crosswalk or intersection, remember the vehicle has the right-of-way. Make it easy for drivers to see you. Dress in light colors and wear reflective materials. Yield to pedestrians crossing in marked crosswalks or at intersections. Failure to yield to a pedestrian in a marked crosswalk is a violation of Arkansas law.